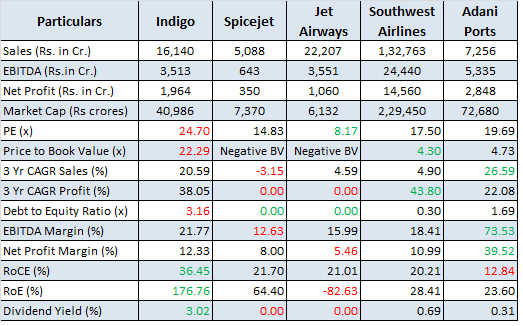 Overview: IndiGo is the market leader in Indian aviation with a low cost carrier model. They have a leading domestic market share of 40.4%. The revenue and profit were Rs 19,370 crores and Rs 1,659 cr. resp. for FY17. The Income, EBITDA and profits have grown 32.7%, 25.6% and 19.4% CAGR over 8 years. Aggressive growth plans are in place for capacity addition. Key risks: 1) Competition has intensified in the domestic market, weakening pricing power 2) A sharp rise in fuel prices is a risk to profitability. As a result EPS has reduced recently. Opinion: The valuations are rich currently and hence investors are advised to HOLD the stock until earnings recovery process begins. On 5th Feb, 2016 we had published a report for subscribers for a BUY call at Rs. 829 after sharp share price fall on account of a one-time event. The share price is up 21.8% since then and is now being released for public viewing. SIGN UP for the investment service subscription to gain exclusive access to such high quality investment reports. 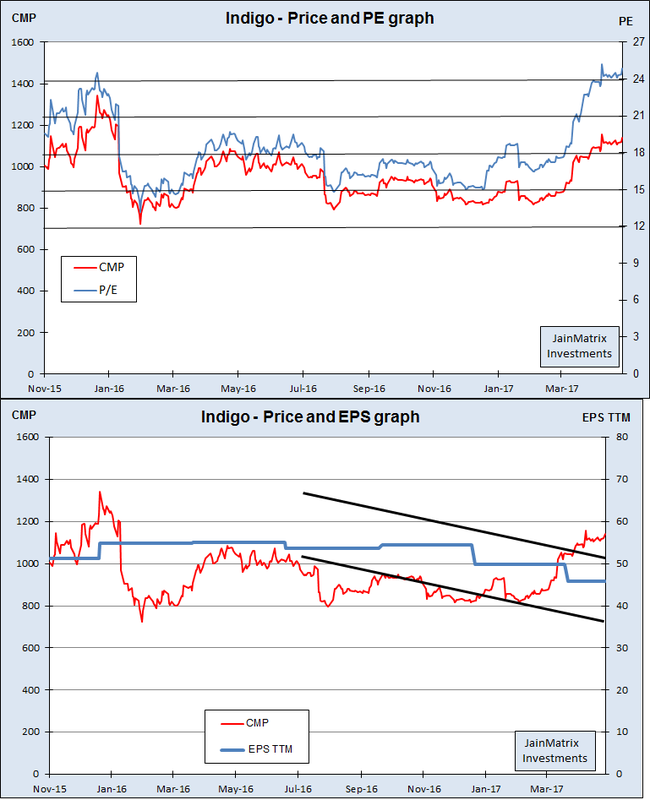 Here is a note on the IndiGo Airlines (IGO). IndiGo is a low-cost carrier airline based in Gurgaon, India in operation since 2006,. IGO’s revenue and profit were Rs 19,370 crores and Rs 1,659 cr. resp. for FY17. Market share based on passenger volume was 40.4% in FY17 for the domestic market. Owned by InterGlobe Enterprises, IGO operates 896 daily flights to 44 destinations including 6 abroad of Bangkok, Dubai, Kathmandu, Muscat, Singapore and Doha. It has its primary hub at Indira Gandhi Intl. Airport, Delhi and operates 131 aircrafts all of which are Airbus A320. IGO’s domestic ASKs (Available Seat-Km.) increased from 530 crore (FY09) to 5458 crore in FY17, growing at 33.8% CAGR. It has an aggressive growth plan, with a current order book of 400 A320 neo aircrafts. IGO added 5 new aircrafts in Q4 FY17. It is also venturing into regional routes, and has signed a term sheet for the purchase of 50 ATR’s (small aircraft). Deliveries will start in Q3 FY17, and by FY19, it will be a fleet of 20 ATRs. IGO’s maintenance costs are the lowest among Indian carriers. Leadership team is Aditya Ghosh (President), Riyaz Mohamed (Aircraft Acquisition/ Financing), Ankur Goel (Director) and Rohit Philip (CFO). Shareholding in % is: Promoters 85.88, QFI’s 6.42, DII 1.65, Individuals 3.40 & others 2.65. IGO declared a final dividend of Rs 34/share which is a payout ratio of 90% and yield 1.4%. IGO plans to use ATR-72 planes to feed its mainline network in a hub and spoke model. Recently it announced a provisional order for 50 ATR-72 planes valued at $1.3 bn. IGO expects deliveries to commence from 2017-end. The new aircrafts will be used to launch flights under the government’s regional air connectivity scheme, UDAN (Ude Desh Ka Aam Naagrik). IGO reported a 24.6% fall in the Q4 FY17 net profit at Rs 440.2 cr. against Rs. 583.7 cr. posted during the same period last year. Its total income was up 18.5% at Rs. 4,848.2 cr. against Rs 4,090.6 cr. YoY. The PAT fell sharply on account of higher fuel prices. IGO recently partnered with Australian flight training institute, Flight Training Adelaide (FTA), to provide training to its pilot cadets. The management of IGO is looking to convert some of its Airbus A320neo planes to A321neos that will allow it to fly more passengers per flight and increase flight range. Engine Problem: Pratt & Whitney 1100G engines of Airbus A320 neo faced technical issues recently. The engine is facing twin problems. One in the combustion chamber and the other is with the third bearing of the engine. IGO executives expect A320 neo engine-maker Pratt & Whitney to provide a solution to the combustion chamber problem by Q4 2018. The Indian aviation industry is the 9th largest market globally. Total passenger traffic stood at 22.36 cr. in 2016 and there were 85 international airlines connecting to over 40 countries. Domestic air passenger volumes are likely to grow 25% for FY18. The Airline industry is a very tough globally, characterized by high airplane costs (the Airbus and Boeing duopoly), high fuel costs, parking, airport and MRO charges. Costs are largely fixed. On the other hand, demand is cyclical and varies by season & economic cycle. Anecdotal evidence shows that the sector is a destroyer of value. Many countries support their national carriers, even though there are losses, as it may be a matter of national prestige. Industry market shares in Mar 2017 are presented in Fig 2. (Source DGCA). The Indian aviation industry has been aided by a slow moving Indian Railways, that is losing market share, had weak capacity growth, poor passenger service levels and slow trains. Indian aviation is expected to become the 3rd largest market by 2020. Indian carriers plan to increase their fleet to 800 aircrafts by 2020. (Source: GoI/ DIPP). A number of foreign investors are present in India including Airbus, Boeing, AirAsia, Singapore Airlines, Rolls Royce, Frankfurt Airport Services, Honeywell Aerospace, Malaysia Airports Holdings, GE Aviation, Airports Company South Africa and Alcoa Aerospace. Indian aviation is experiencing dramatic growth with the emergence of LCC, as well as new carriers, and a growing middle class ready to travel by air for business and leisure. Growth in airlines is causing demand growth for MRO (maintenance, repair and overhaul) facilities. Indian authorities plan to double the number of airports to 250 by 2030. The failure of Kingfisher Air indicates the market is not ready to pay prices of 2-3X of LCC tickets. See price history detailed in Fig 3. The IPO was in Nov 2016, at an issue price of Rs. 765, and the share price has appreciated 38% generating good returns. We can see that the share price had an all-time high of Rs 1,396 in Jan 2016 and a low of Rs. 702 in Feb 2016. Today the share price is 31.7% below the peak and 51% above the low. The annual and quarterly financials of IGO in Fig 4 reveal a steady increase in revenues. Margins and PAT have fallen in FY17 on account of high crude prices. The Income, EBITDA and profits have grown 32.7%, 25.6% and 19.4% CAGR over 8 years. The total debt by end FY17 was Rs. 2,596 cr. The entire debt for IGO is aircraft related. IGO does not have any working capital debt. The D/E of the firm is high at 3.16 times. This is a negative. The margins are moderate with Operating and Profit margins at 15.1% and 8.6% for FY17. The business has generated free cash flows throughout in the last 6 years. This is a positive. The share has traded at an average PE of 18.12 times since listing. Today it is at 24.70 times, so valuations are above historical average. See Fig 6. However trading history is short. The EPS TTM has fallen in the recent quarters, see Fig 7. This is on account of fall in demand post demonetization, higher fuel costs & engine rentals and greater competition. In the airlines sector, fuel costs are a significant proportion of overall revenues. In this context, we can see IGO’s ratio has been volatile and is high currently. See Fig 8. The aircraft fuel expenses and engine rentals have risen sharply in 2 years. The load factor has been flat over the last 8 quarters. From the chart below we can see that the yield has fallen significantly over the last 8 quarters. In the recent quarter, the yield was impacted on account of fall in consumer spending post demonetization. However the management in confident of fast recovery in yields. See Fig 8. With load factor 86.1% recently and rising, IGO is performing impressively. Sales and PAT Growth has been impressive at IGO over the last 3 years. Debt is high and that is expected in this industry. With cash flow improving in recent quarters, we can expect that they would be able to control debt while investing in capacities. Margins are moderate, however leading amongst the listed Indian peers. Dividend yield is high. This is positive. The valuations appear expensive, both in terms of P/E and P/B ratio. IGO dominates with a large market share in one of the largest & fastest growing aviation markets. It’s a successful implementation of the LCC business model with single aircraft type, high aircraft utilization, high operational reliability, no-frills product, and low distribution & maintenance costs. IGO is a strong brand developed with good advertising & marketing strategies. It has maintained consistent profitability and strong cash flow generation in the last 6 years. By placing a large Airbus aircraft order, IGO has gained a structural cost advantage with favorable terms on aircraft, engines and components, and got a young, modern and fuel-efficient fleet. On delivery, the aircrafts are sold and leased back. This arrangement is efficient as it converts fixed costs into variable. The asset light approach keeps capital expenses under control. Experienced management with US background, has executed well so far in the Indian context. IGO has been fast to plan for UDAN, which is a new opportunity in regional connectivity. The quality issues with newer airplane deliveries can threaten operations and services. The management feedback is that in 1-2 quarters the issues will be handled by the vendors. Depreciation of the INR against USD may have an adverse effect on IGO’s operations and costs. This has worked in favor of IGO with rupee strength in last 1 year. Crude oil prices are a high cost component, that is outside management control. Prices have risen sharply in the last 1 year and they can further rise again. IGO does not hedge for fuel cost volatility, hence if fuel costs rise further, it could further impact financial performance. Competition may intensify with the entry of Air Asia and Vistara, which have strong backgrounds, and capacity expansions of Spice Jet and Jet Air. Any production delays with ordered aircraft would affect IGO’s expansion plans. IGO’s international routes expose them to higher operational risks. However it is believed that these routes have higher profit potential compared to domestic routes. IGO’s financials may fluctuate due to seasonality as well as economic cycles. There may be a skills shortage in areas such as airline pilots, maintenance engineers, etc. In the past airlines needed to hire expatriate staff at high costs to overcome this. Airlines are a cause of pollution due to usage of fossil fuels. There may be increasing pressure on airlines to reduce this in terms of capacity limitations or carbon credit requirements. IGO, like other airlines, faces operational risks such as accidents and terrorism. There are high regulatory challenges for IGO including DGCA and AAI compliances, policies and execution and ATF taxes. However the business climate in India is improving. There’s no doubt that the Airline industry in India is at a early phase of growth. With high population and weak railways execution, growth will track economic growth and affluence in India. IGO has a strong brand with a commanding domestic market share, consistent delivery and high growth. It has a good track record of profitability and free cash flows. It has executed well on its LCC strategy. IGO has expanded the market with its growth. We feel that IGO will continue to dominate Indian skies due to network effect and good capacity additions. Any fall in crude prices can provide high upside risks to IGO profitability. While IGO has been in profits consistently, the margins depend inversely on crude prices. The valuations are rich currently and hence investors are advised to HOLD the stock until earnings recovery process begins.